My daughter had a large sweet 16 birthday party this summer. We purchased several pizzas - at the time Little Caesars had a 2 for $10 promotion and we immediately knew where we were going to get our pizzas! The kids (and adults) were well fed - even with 20 plus teenagers, there were plenty of leftovers! 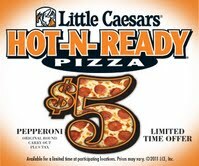 Thanks to Little Caesars I have one $10 gift card to give away. Simply post what menu item is your favorite. my participation by sharing this information with my readers. In addition, I received a small gift card to thank me for posting. good ole pepperoni pizza. I love Little Caeser's! Their crazybread is the best. That and pepperoni pizza are my favorites. I Love Their Pizza Any Kind Is My Favorite. I like the Pepperoni Pizza. Love their pepperoni pizza thanks! the crazy bread is my favorite! My favorite is 3 Meat Treat Pizza :) *Thanks* for the giveaway! i LOVE their bread sticks! I love their Crazy Bread!